This new campus was to provide treatment and housing for adolescents with significant behavioral problems. Dining, on-campus education, recreation, outdoor programs and operator administration were also needed. Security was a mandate. 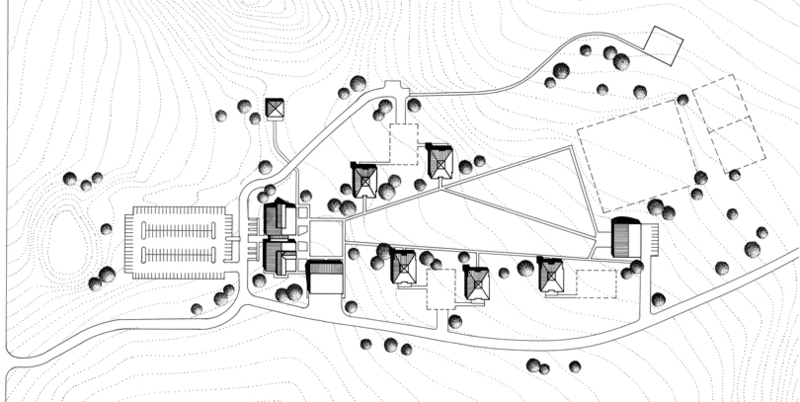 A 45 acre gently sloping rural site in the Colorado foothills was selected for privacy, security and ability to house therapeutic equestrian and outdoor programs. The campus was designed to form a south facing quadrangle, with buildings creating a central common space. The main administration and education building, shown below, creates an attractive front entry piece to the campus and security checkpoint. The buildings were designed to fit well within the agrarian context of farmhouses and barns, and represent the residential, unobtrusive character the service provider desired. A gym, ropes course and equestrian area form the south end of the campus, allowing for views to the foothills beyond.